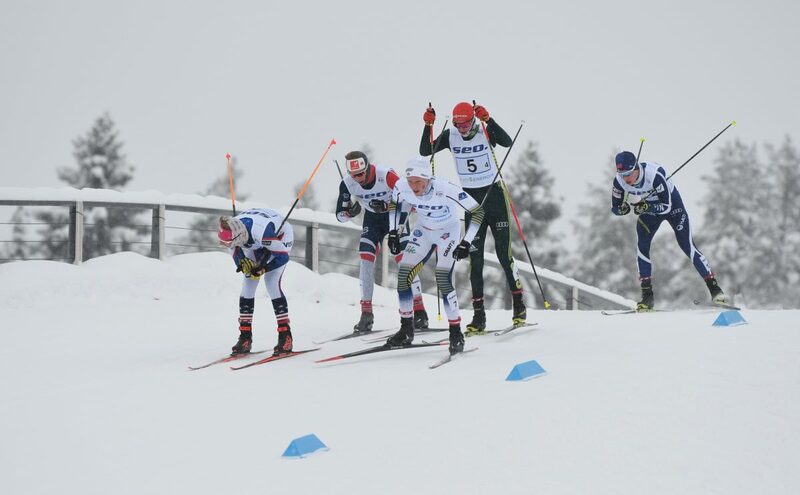 Nordic skiing doesn’t exactly come to mind when considering the X’s and O’s of sport. Those who don’t ski on Saturdays or Sundays might be familiar with football’s schematics. The arrows, the diagrams, the dense playbooks. Basketball has symbolism: X’s in the key, plays for a pick and roll, defensive shifts from zone to man-to-man coverage. The cross-country analog, and maybe this is a stretch, is the line-up for the 4 x (add a distance) relay. Where do you place the aerobic powerhouse or the kid who might just box out another team from taking a key position? Does the big-motor ski the scramble leg or the anchor? Or maybe somewhere in between? Kaeding’s calculus, made in consideration with other U.S. coaches along on the trip, including former D-Team coach and current Cross Country Sport Development Manager Bryan Fish, was to keep the U.S. in touch with the front pack, and at times, leading it. “We kind of talked with each of the guys separately and kind of talked about tactics, but one strength we felt our team had, was just simply the depth,” Kaeding said of the U.S. foursome. On the surface, the Xs and Os manifest most starkly with the lineup. 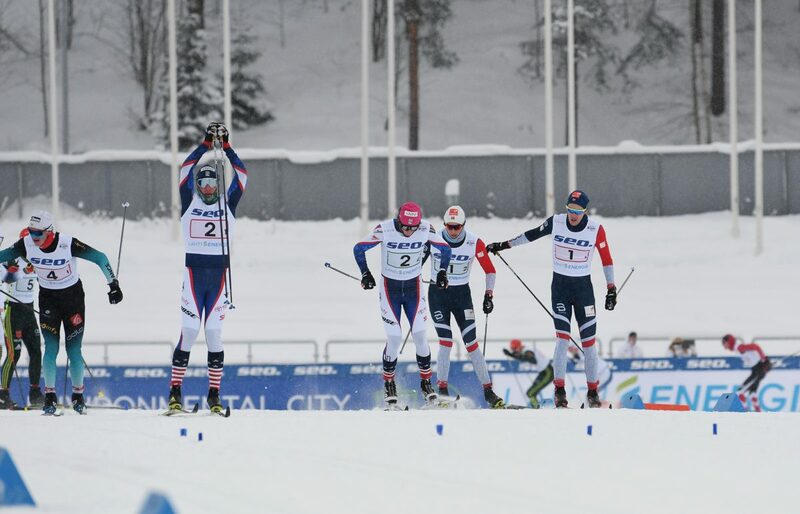 For the U.S., Luke Jager skied the first classic leg, Ben Ogden the second. The skate legs were handled by Johnny Hagenbuch and Gus Schumacher. Three of the four had been here before. 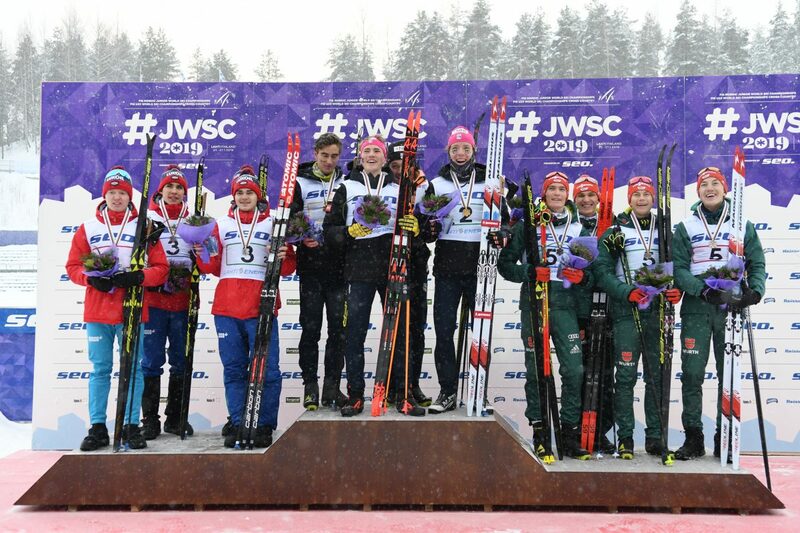 At last year’s World Juniors in Goms, Switzerland jager, Ogden, Hunter Wonders, and Gus Schumacher skied to a sensational second in the 4 x 5 k relay. With Hagenbuch in place of Wonders, who is now at U23 Worlds, on paper at least there was no loss in capacity. Around the 3.5 k mark of Jager’s scramble leg, the U.S. skier upped the pace. Evident from the drop-off, many teams paid the price in oxygen debt. Jager’s initial surge wasn’t a “snap” for chasing teams. But it was enough of a push that at the 5 k mark when Jager tagged to Ogden, the U.S. handed off in first, followed closely by France and Norway less than a second back. Germany, in fourth place at this point, was ten seconds back. Like Jager, Ogden helped make and sustain a separation. When Ogden came through the tag zone in first, Germany was 2.2 seconds back, Norway 2.6. The next closest team, Sweden, dangled 15.9 seconds behind in a train including France, Russia, and Finland. Hagenbuch stayed true to the team’s formula: ski near the front and don’t cede position. He too kept the team in gold medal contention when he tagged Schumacher in third, 2.0 seconds behind Germany in first and Norway in second (+0.6). At 16.1 k, with 3.9 k remaining in Schumacher’s effort, Russia was approximately 10 seconds behind the U.S. By 19 k Russia had nearly made contact to the U.S., skiing 2.8 seconds behind the first place U.S. team. From Schumacher’s eyes, the gamesmanship was tense. With Norway slowing the pace and Germany upping it, Sweden, Russia, and Finland made contact with the three front teams. 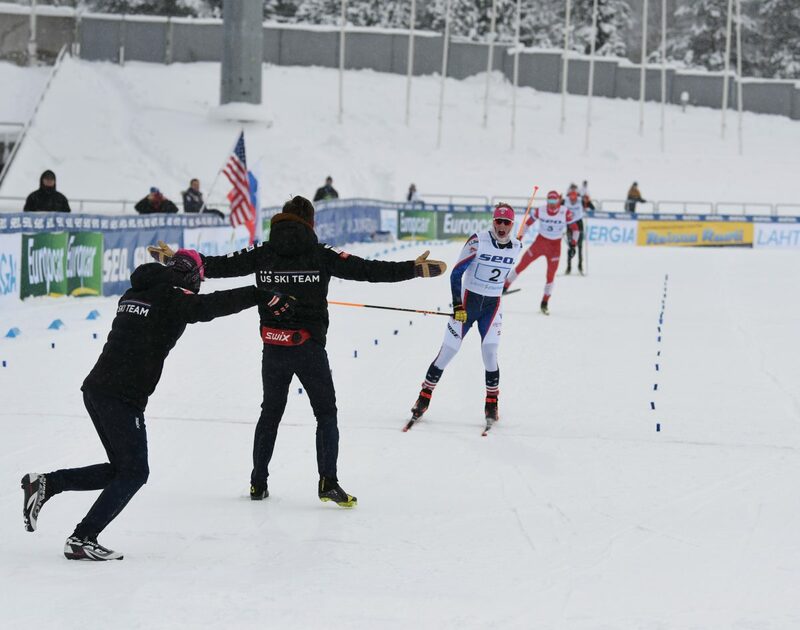 “So by 2.5 k into my leg, we were all together in a group and I was definitely a little nervous because there were some great sprinters in that group,” Schumacher told FasterSkier in a call. 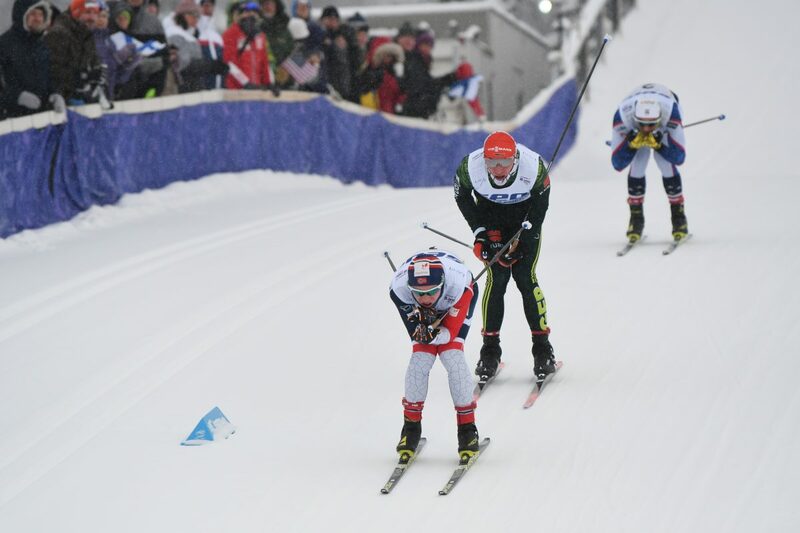 Despite skiing a classic sprint, a 15 k skate, and a 30 k classic mass start (in which he placed fourth overall), Schumacher said his focus on the relay remained. The vision in the last kilometer was clear and straight ahead. In any other parallel universe where Russia maybe hangs on, or Schumacher comes from the back, that simply did not play out in the here and now in Lahti. 45:34.7 was the winning time for the U.S. Russia placed second (+3.8), German third (+6.3). 45:34.7 minutes, a finishing time these young men will not soon forget as they evolve as athletes and tell tales of their historic win.